In third pAsuram, parAnkuSa nAyaki says “I don’t need my modesty which is not desired by the greatly distinguished emperumAn who showed great affection towards me previously”. Subsequently, parAnkuSa nAyaki desiring to explain anishta nivruththi (removal of unfavourable aspects) etc which make emperumAn the upAyam (means), in the subsequent pAsurams fully, first starts explaining the killing of pUthanA who appeared as an anUkUla Sathru (enemy in disguise), and says “There is no use of my modesty when it is not desired by krishNa who descended from the serpent bed”. Third pAsuram. parAnkuSa nAyaki says “I don’t need my modesty which is not desired by emperumAn who is capable of destroying the enemies, who is greatly distinguished and who was greatly affectionate towards me previously”. kuRaivu ilam – what use is there? pUthanA (the lady devil) arrived in the form of mother yaSOdhA who has no shortcoming in her affectionate heart; kaNNan emperumAn, being an innocent toddler, knowledgeable about different tastes, completely sucked [her vital air] from her breast which is covered with strong poison; what is the use of my completeness in my feminine nature when it is not desired by such emperumAn who rests on the serpent bed, who is having mountain like huge shoulders, who is the supreme lord and who is having infinitely amazing qualities and activities? mada nenjAl kuRaivillA – madappam – tenderness; that is having a soft heart. pUthanA assumed the care which is usually shown by mother yaSOdhA while she nurses krishNa. While she had hatred inside her towards krishNa, externally she manifested favourable intent. magaL thAy seydhu – makkaL has become magaL – it indicates human being. Though she was a devil, she assumed the form of a human being, that too assuming krishNa’s mother’s form as said in periya thirumozhi 1.3.1 “peRRa thAy pOl” (like his own mother). oru pEychchi – How wicked! Implying “Unparallel wickedness”. It can also be considered as disregard for her as saying “some devil”, due to parAnkuSa nAyaki having anger on pUthanA’s act of trying to kill krishNa. vida nanjam – Repetition of poison by saying “visham” and “nanjam” – this implies the heavy nature of the poison; when compared to this, other poisons appear to be nectar. pEychchi vida – To have her life taken away. nanja mulai suvaiththa – One who consumed [through] the poison-afflicted breast. As said in periya thirumozhi 1.3.1 “uyirai vaRRa vAngi uNda vAyan” (emperumAn who sucked her life), he sucked in such a manner that along with milk, her life too came out; to get her life out of her, as said in SrIvishNu purANam 4.5.5 “prAnasahitham papau” (along with the life). migu gyAnach chiRu kuzhavi – Though he was an infant, due to knowing the different tastes, he spotted that “this is not my mother’s breast; it is someone else’s breast” and fed on it. Alternative explanation – though she comes as his mother, and though he may consider her to be his mother, the nature of the object [poisonous milk] will have its effect. 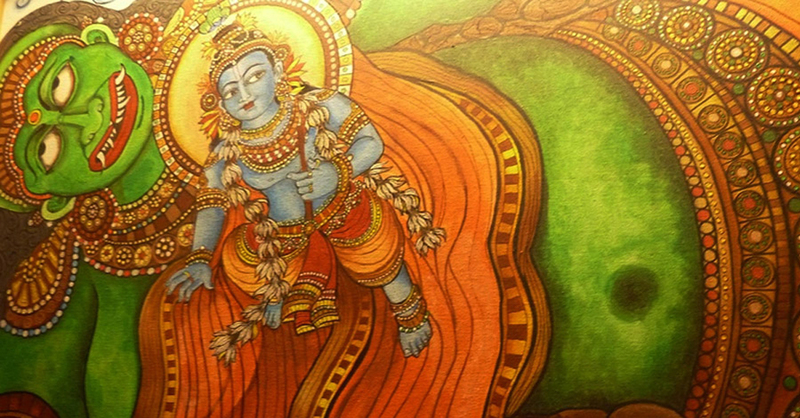 pada nAgaNaik kidandha – His resting place also matches what he consumes. He consumes poison and reclines on a poisonous serpent. Poison is the antidote for another poison. Two explanations – after killing the enemy, emperumAn goes and rests on the serpent; another explanation – as said in hari vamsam 113.62 “nAgaparyankamuthsrujya” (he descends from the serpent bed), he steps out from his bed and kills the enemy. When he hears the cry of his devotee, his heart will not be satisfied with “bhOga” (bhOga means enjoyment as well as serpent). Due to the joy of sarvESvara resting on him, his (Adhi SEshan’s) hoods will be expanded. Just as demoniac entities will be killed when they approach [emperumAn] as said in mUnRAm thiruvanthAdhi 66 “vAyndha madhu kaidaparum vayiRurugi mANdAr” (even the brave madhu and kaitap got killed), when devotees approach emperumAn, they will end up with a joyful life. paru varaith thOL – The changes in the EkarUpa (unchanging form) of emperumAn after coming in contact with thiruvananthAzhwAn (Adhi SEshan) is explained. For emperumAn, except for no changes/impacts due to karma [puNya, pApa], if we say that there is no change at all, then there is no point in desiring to embrace such emperumAn. param purudan – As a diamond pressed on a gold plate will shine more than ever before, emperumAn, after reclining on Adhi SEsha, appears to be “sarvAdhika” (greater than all). kavarAdha – If one who showed great attachment like this before, disregards me now, what is the use of my sthrIthva (feminine nature)? niRaivu – modesty. That is, the feminine nature, where a woman does not reveal to others, what is in her mind. This entry was posted in thiruvAimozhi, thiruvAimozhi 4th centum on March 29, 2017 by Sarathy Thothathri.